Experiencing Rheumatoid Arthritis: A Smile For You! Plum purtty? Reminds me of the joke when the man and woman riding down the road and passed this farm house and the man asked the woman if them [ farm animals ] was her kinfolks and she said yes " THEY ARE INLAWS " . Have a blessed evening ! Ron. That's awesome!! I got this from my college friend the other day. I just dropped by to say hi and let you know that even though I haven't been given a completely clean bill of health, my infection is gone for now, so we'll take the blessings in whatever form they come. I pray that you'll have a blessed Holy week...blessings and (((HUGS))) to you! A man is driving on a country-road when a chicken crosses the road totally unexpectedly. The man runs over it, stops and goes to the nearest farm and asks the farmer if it was one of his chickens. The farmer looks at it from all angles and says:" Nope. Ain't mine. Mine ain't that flat." Have a very blessed day, dear brother. I got this from Bro Ron and I thought it was so cute, I would share it. It's good to hear your infection is gone, that's a step in the right direction. One prayer answered! I keep you in my prayers, dear sister. May God continue to bless you. Hahaha, yeah we sure did! I am glad it still worked out after that haircut I tried to give you with those sciccors we found. grin. Have a wonderful and blessed day, dear sis. oh, lol, Corry, you always manage to make me smile. Thank you so much! hihi, I love those two monkeys. 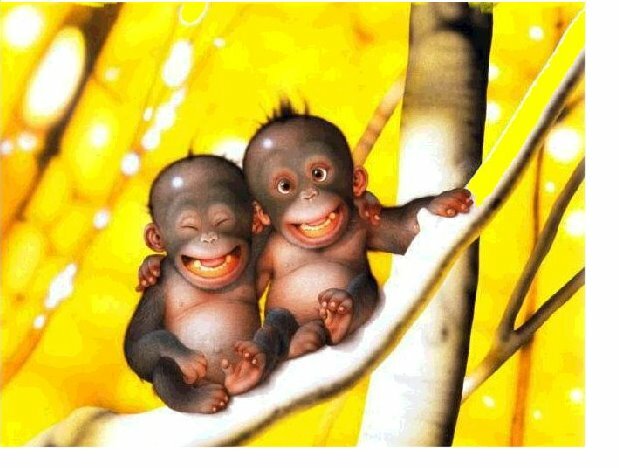 I used to have that picture on my msn, and the one on the left represented my brother, and the one on the right represented me! sorry for my sillty comment. Thanks for making me smile!!! It's not a silly comment at all! I am glad it made you smile, that's what it was all about, to give a smile. And it worked, hehe. And we got something else to look forward to, to smile about and praise God. Easter! Corry, Great picture. I'm grinning like this today. It's Friday and I have an unexpected afternoon off. Happy Easter! Sarah, My mom used to sing that for my sister and me, too. I love that song. She also use to sing "10 in the bed and the little one said roll over, roll over so we all roll over and one fell out. 9 in the bed..etc." Hope you have a good day. Please feel free to "rattle" all you like. I enjoy it! That way I know I am not the only one who rattles, grin. Can I come over and help baby~sit? I was over here earlyer but forgot to sign in. Yeah!! Sure, come on over!! The more, the merrier! Be warned though, he got his DTP-shots yesterday, so he is a little fussy. And he doesn't need a haircut, hehe. Don't worry about forgetting to sign in. We all have our senior-moments. grin. Have a blessed day, dear sis. and Happy Easter to you! And a very blessed and Happy Easter to you as well, sis. And a very happy and blessed Easter to you as well, lieve zus!